Imagine you’re starting with the alcohol on the left and you’d like to get to the alkene on the right. What bonds are formed and broken here? We’re forming C-C (π), we’re breaking C-H, and we’re breaking C-OH. It’s an elimination reaction. Notice a problem here? We need to have HO(-) as a leaving group. If you’ll recall, strong bases [like HO(-) ] are terrible leaving groups – which makes the E1 pathway unlikely. So what if we tried to use a strong base, maybe trying to promote an E2 reaction? Well, that would be even worse – we’d likely deprotonate OH before the C-H, and you can imagine that we’d have to have O(2-) as a leaving group here. Not good! That means that the reaction, as written, is very unlikely to happen. Yet, there is something very simple that we can do to make this reaction work. We’d need to have a better leaving group (a weaker base). How can we do this? 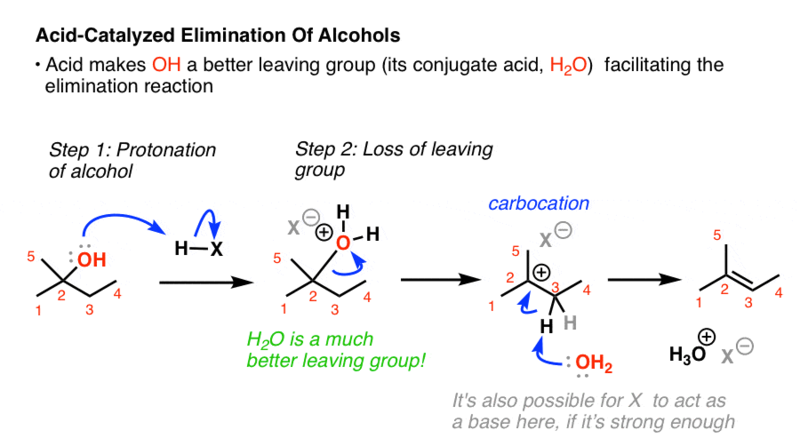 If we add a strong acid, we turn OH into H2O+, the conjugate acid is a better leaving group. Now, water can leave, forming a carbocation; and then a base can break the C-H bond, forming the alkene. Notice that this is now a classic E1 reaction. The rate is going to be dependent on the stability of the carbocation. This one is tertiary, so it should proceed at a reasonably high rate. A question arises here. What’s going to act as the base? As it stands, a C-H bond adjacent to a carbocation has an extremely high acidity (at least below -2, if you follow pKa). That means that just about any weak base (water, or the conjugate base of the acid) is sufficient to deprotonate the carbon. It’s possible that more than one species can act as a base here. I’ve shown water removing the proton, but it’s not unreasonable to show the conjugate base of the acid removing the proton in most circumstances. Now comes one of the things about organic chemistry that often causes trouble for students. For one of the first times in our discussions here, we’re dealing with a situation where we can have competing reactions. Let’s back up. The E1 reaction goes through a carbocation, correct? Well, if you’ll recall, so does the SN1 reaction. We’ve already seen examples where a carbocation was formed from an alcohol by adding a strong acid like HCl, HBr, or HI, and we ended up with the alkyl halide. Why? The halide ions are decent nucleophiles under the reaction conditions. So how can we stack the deck in favor of the E1 process? Use a strong acid with a conjugate base that is a poor nucleophile. The usual choice is H2SO4. The HSO4(-) ion is a relatively poor nucleophile due to the negative charge of the oxygen being distributed throughout the molecule (resonance). Two other acids you might see for this purpose are p-toluenesulfonic acid (p-TsOH), which is essentially a cousin of H2SO4, and phosphoric acid (H3PO4). Also, don’t forget that elimination reactions are favored by heat. 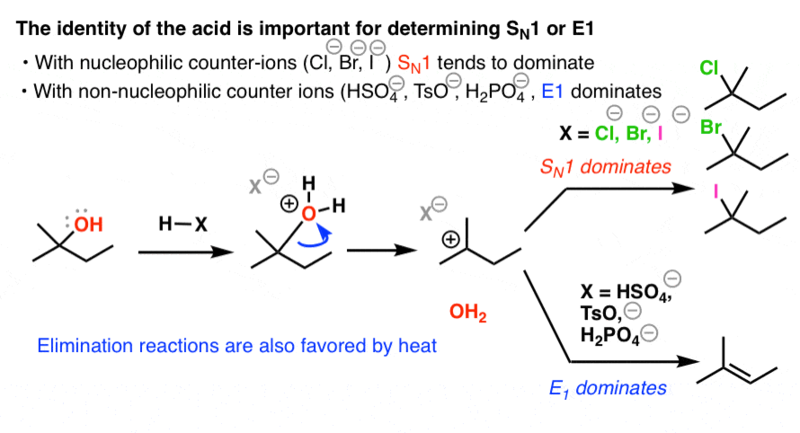 In summary, if you’d like E1 to predominate over SN1: choose an acid with a weakly nucleophilic counterion [H2SO4, TsOH, or H3PO4], and heat. If you’d like SN1 to predominate over E1, choose an acid like HCl, HBr, or HI. We’re almost done talking about elimination reactions. Next post – we’ll talk about rearrangements. I disagree that the conjugate base of the strong acid is a competent base for the final deprotonation. It’s logical and makes the reaction obtain a certain amount of symmetry (especially if you stress that H2SO4 is catalytic), but imho HSO4- is too weak of a base to be a competent base in that deprotonation. Same with Cl- or TsO- or any of the other conjugate bases of strong acids. In my class, HSO4- as a base would be marked incorrect. For H2SO4 I get a pKa of -3 or so, so I don’t think it’s unreasonable to draw it acting as a base. But I see your point, especially regarding the last part! Carbocation can give a proton to a base at elimination reaction. E1 is just alternative of SN1. Am I right?